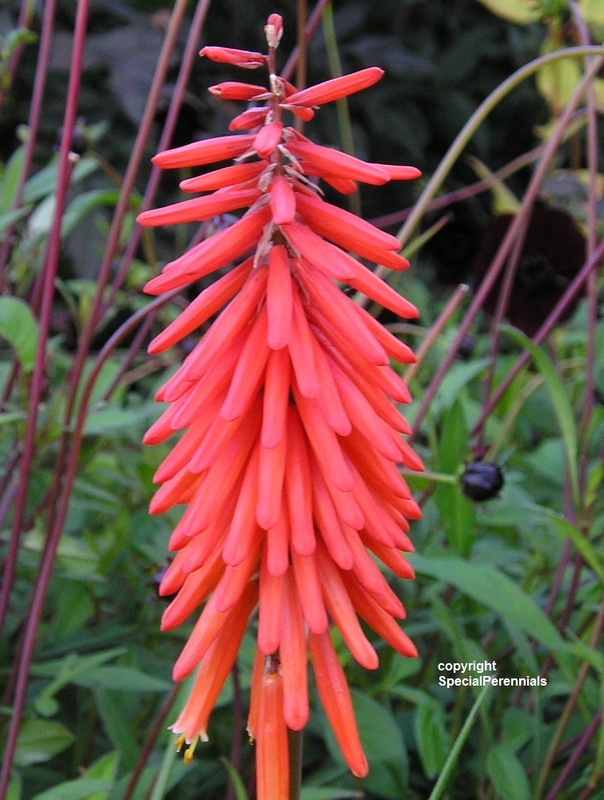 Kniphofia: Red Hot! or not? I've got a bit of passion for Red Hot Pokers, Kniphofia. The time divide them is early spring or after flowering for the earlier varieties, provide you have a coldframe or greenhouse to keep the plant in whilst they root up. By judicious choice of varieties and species you can have pokers in flower from May to January! Kniphofia sarmentosa often flowers during the winter months, the flower heads taking from November through to January to push up and open their buds. In the low light levels the flowers do not achieve there full orange glow, but are welcome none the less. At this time of year many Kniphofia will become dormant and die back to buds just below ground level. Provided your soil isn't constantly water logged you should not worry when this happens. Some types, "Little Maid" amongst them, may not reappear until well into May, so give them time before giving them up for dead. On Kniphofia that retain their leaves, cut worms can be a winter pest - watch out for them sitting, snug down in the centre of a leave stem eating the tender growth in the centre.